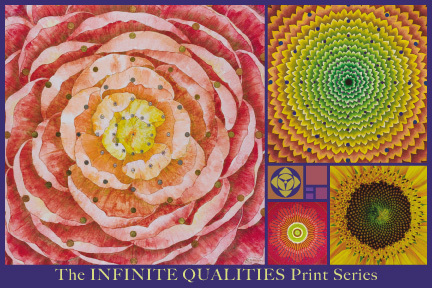 The Infinite Qualities series of floral mandalas came about in answer to two questions: “How can my work benefit the greatest number of people?” and “How can visual art support the healing process?” The circular, mandalic format represents integrity, interconnection and perfection. Each mandala conveys a quality essential to wellbeing: hope, vitality, compassion, unconditional love and creativity, among others. The mandalas are floral because initial Evidence Based Design research indicates that nature motifs have the greatest benefit for hospital patients. Sacred Geometry overlays reveal the order and balance found in nature, a source of comfort and inspiration. Or, artwork can instill a calm, peaceful feeling, as most of the focus group members reported having experienced. Since it has been estimated that 75 – 90% of physician office visits are for stress related problems, calm inducing artwork is an important asset to any environment. A third way artwork can support the healing process is by acting as a focal point for meditation. The Infinite Qualities series of floral mandalas act as maps for embodying qualities, such as hope, essential for wellbeing. Each has an accompanying guided meditation and practices designed to help one integrate the desired quality. With repeated use, the mandala and the practitioner are mutually empowered.